Newport Gwent Dragons chairman Martyn Hazell has called for the Welsh Rugby Union to outline the regions' role. The Scarlets, the Ospreys, the Cardiff Blues and the Newport Gwent Dragons were all knocked out of European competition in the Pool stages. And Hazell claims the regions are the poor relations compared to the other teams competing in Europe. "It's like Chelsea playing Newport County, and you know what the result would be," said Hazell. The Ospreys, Cardiff Blues and Llanelli Scarlets all failed to reach the quarter-finals of the Heineken Cup, managing just three wins and a draw out of 18 pool matches. 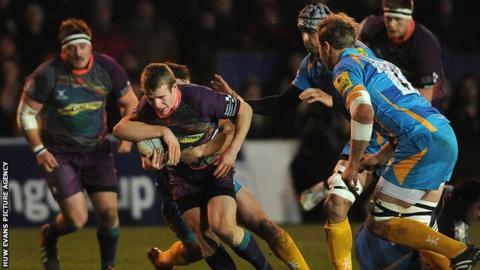 The Newport Gwent Dragons, who failed to qualify for the Heineken Cup, were knocked out in pool stages of the Amlin Challenge Cup. Hazell has echoed the view of Ospreys forwards coach Jonathan Humphreys who claimed the Welsh regions do not have the money to compete with the rest of Europe. "The European game is all about money," said Hazell. "The Welsh regions haven't got any money, we have a wage cap of £3.5m and some of these other people don't have a wage cap at all. "We are playing £2.5m sides against £10m sides, it just doesn't work out. "The Welsh Rugby Union has to come out of the closet and say how they see regional rugby and Welsh international rugby. "What is their view for the future? They have not said exactly what they think it is. They have to come out of the closet and do it." While Wales' regions have struggled in Europe, the Ospreys are the most decorated side in the Pro12, winning four titles, and Wales have won three Six Nations Grand Slams in eight seasons. Wales' four regions receive £3.5m each a year, the money coming from playing in televised matches and a contribution from the WRU. The regions have introduced a salary cap of £3.5m a year, and are still in negotiations with the WRU over the future funding of the professional game in Wales. That follows a report by accountancy firm PriceWaterhouseCoopers, which questioned the financial viability of regional rugby. The regions have also been hit by the departure of a series of high-profile international players to French and English clubs. These include Huw Bennett (Lyon), Lee Byrne (Clermont Auvergne), Luke Charteris (Perpignan), James Hook (Perpignan), Gethin Jenkins (Toulon) and Mike Phillips (Bayonne) in France. Craig Mitchell (Exeter) and Paul James (Bath) are playing in the English Premiership, while Wales and Lions centre Jamie Roberts is leaving the Blues at the end of this season.